This loop on Green Mountain is easily accessible from the metro area for those in need of a quick ride. It can easily be accomplished in an hour with stops to take in the great views, including the 360 degrees offered from the summit of Green Mountain. It's just one of the possibilities in the area - there are many loops you can make in the area. None of the trails are particularly long or difficult, with the exception of Box o' Rox so it's hard to go wrong if you want to just go out and explore. The trail follows mostly singletrack with a short section along a service road up to the summit. The singletrack is well traveled with enough rocks to make it interesting, but not too many. Start out from the Florida Lot - one of the two larger lots for this trail system. As you depart the trailhead, take the first right, which will put you on Green Mountain Trail going up Green Mountain. It can be a rough beginning to the ride with sudden steepness, but it becomes more gradual once you're around the first two switchbacks. You'll come across a trail that breaks off to the left. Do not take that trail. Stay on the main one the heads towards the radio tower. About a mile into the ride you should approach the radio tower. Stay on Green Mountain Loop by taking a left onto the service road that continues up the mountain. This part is a good place to recover from the last climbs as the road gradually climbs the ridge. About half a mile up the service road it begins a much steeper climb, approaching the summit. At the top of the service road take a left onto the short, rocky Rooney Valley Trail that leads to a cairn at the top of Green Mountain. This place provides a great break to take in the views of the metro area before the fun descent ahead. Take the trail off the top of the mountain heading southwest. You'll quickly approach a trail intersection. Continue straight on Rooney Valley Connector. The descent is fun. Be careful with your speed on a couple of the left handed turns on the way down that are sloped outward so you don't run off the trail. After a little over a mile of descent, you'll approach an intersection in the trail. Take the left that will put you on Green Mountain Loop heading back towards the trailhead. From here on out, it is a rolling trail with ups and downs that provides a good end to the ride. A couple of the climbs can be a little unexpected so be ready. You'll also pass a couple more trail intersections. Continue straight each time and before you know it you'll be back at the trailhead. Nice ride, ball busting climb out of the parking lot but then it evens out. Fantastic downhill on the backside. 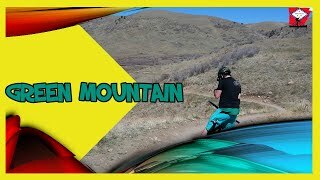 First Run at Green Mtn. with Meg! First day back post broke scapulae... felt great! A nice easy ride for beginners. A relatively wide single track with very little obstacles and no big drop-offs. rode it Sept. 9, 2013. Fun would recommend if in the area. Not necessarily worth a trip. The trail is wide and smooth along the ridge. A beautiful day to ride Green Mountain!